Boys play soccer in San Paulo, Brazil, on Sept. 1, 2012. Their neighborhood was part of a favela upgrading project. A boy plays with a soccer ball on Nov. 9, 2010 in Rio de Janeiro, Brazil. This sharp decline coincided with the introduction of Brazil’s first cash transfer programs in 2001. Created to reduce poverty in the short-run, these programs also provided incentives to households to invest in their children’s education, health and nutrition. Brazil was following on the success of Mexico, which a couple of years earlier had introduced PROGRESA, perhaps the world’s best-known and most influential conditional cash transfer program.5 Brazil consolidated its programs into one program, called Bolsa Familia, in 2003. Bolsa Familia targeted households whose per capita monthly income was less than 120 reais (a yearly income of $828). The government paid these households between 20 to 182 reais per month (between $132 to $1,248 a year) if they met certain conditions: Children under the age of 17 had to regularly attend school; pregnant women had to visit clinics for prenatal and antenatal care; and parents needed to make sure their children were fully immunized by age 5 and received growth check-ups until age 6. It also provided a small allocation to extremely poor households with no strings attached. By 2010, Bolsa Familia had grown to one of the world’s largest conditional cash transfer programs, providing 40 billion reais (about $24 billion) to nearly 50 million people, about a quarter of Brazil’s population. So what role did Bolsa Familia play in the decline of inequality in Brazil since 2000? With such a large transfer of money from taxpayers to Brazil’s poorest, you’d imagine there must have been some impact, but how much of one? Identifying the causal effects of large, nationwide government programs is challenging. Many factors can affect the distribution of income over time. Shifting demographics, the changing nature of work, and women’s participation in the labor force can all affect income inequality. If you wanted to truly isolate Bolsa Familia’s effect, you could theoretically conduct an experiment — not unlike the trials that pharmaceutical companies routinely do to test a drug’s effectiveness — where you’d randomly assign some communities and not others to the cash transfer program, and then compare inequality between them. Using this approach, two studies — a 2010 paper on Brazil (by Ricardo Barros and co-authors from Brazil’s Institute of Applied Economic Research) and a 2013 paper on a number of countries in Latin America including Brazil (by the World Bank’s Joao Pedro Azevedo and co-authors) — have separately found that government transfers accounted for about 40 percent of the decline in inequality in Brazil, with expansions in pensions and Bolsa Familia (and a related program for people with disabilities) contributing roughly equally to the decline in income inequality. However, of these government transfers, Bolsa Familia was by far the most important component in raising the income levels of Brazil’s poorest households: Between 2001 and 2007, the share of people receiving these conditional cash transfer payments increased by more than 10 percentage points, from 6.5 percent to 16.9 percent. This accounted for the entire increase in the share of households that received non-labor income (i.e. income from sources outside of working a job). Hence, available estimates suggest that Bolsa Familia contributed about 15 to 20 percent of the decline in income inequality during the decade starting in 2000. These effects were most likely achieved by putting money directly into the pockets of poor households.8 Because the money is tied to parents’ investing more in their children’s health and education, advocates of the program hope these cash transfers will not only reduce poverty in real time, but keep the next generation from poverty as well. And it appears Bolsa Familia may also have had some success in this respect: Paul Glewwe of the University of Minnesota and Ana Lucia Kassouf of the University of Sao Paulo found in 2012 that the program has led to improvements in children’s school enrollment and advancement, which could translate into higher incomes for them as adults and further reductions in poverty and inequality. But if Bolsa Familia only accounted for 15 to 20 percent of the drop in income inequality in Brazil, what contributed the most? The same two studies agree that rising wages among the poor were the main driver of the decline in inequality in Brazil. While their methodologies differ slightly, the studies show that changes in labor income accounted for 55 to 60 percent of the drop in income inequality. And why did wages for the poor rise? Even before Bolsa Familia, the Brazilian government adopted policies that expanded access to education: Between 1995 and 2005, the average schooling among workers increased by almost two years. At the same time, the hourly wages for a worker with a given level of education rose much faster among the poor than the rest of the population, likely due to the increased demand for low-skilled labor that accompanied the commodity and price booms experienced in Brazil, and Latin America more generally, according to research by Leonardo Gasparini of the National University of La Plata in Argentina and co-authors. So, a combination of public policy (expansion of access to education and government transfers to the poor) and favorable market factors (rising wages for low-skilled workers) led to substantial declines in inequality in Brazil. 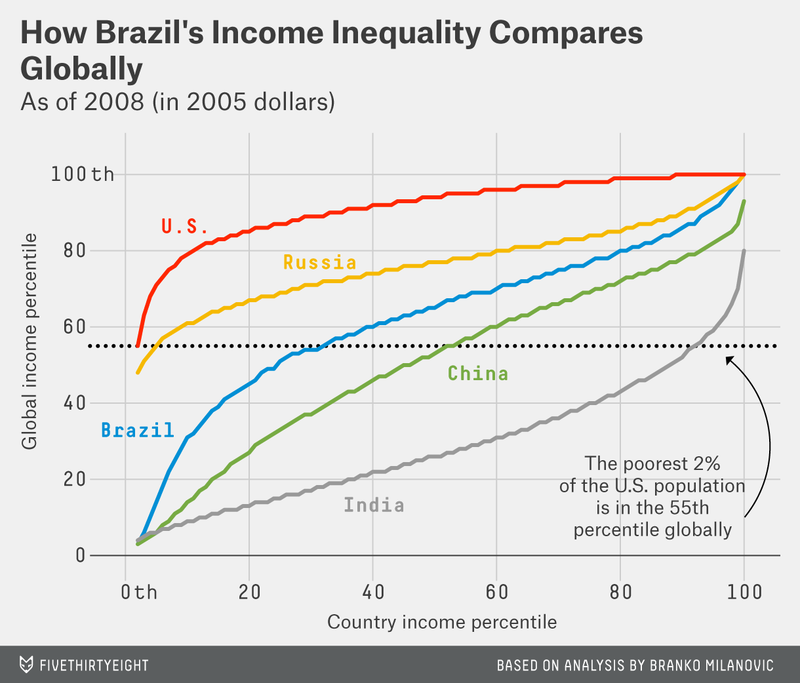 Income inequality in Brazil and Latin America remains high. Barros and his co-authors estimate that almost two more decades of similar progress is needed to bring income inequality in Brazil down to the world average.9 Expanding cash transfer programs like Bolsa Familia might be tough for the government, particularly in periods of tighter budgets. However, experimentation with these programs’ design (in Brazil and elsewhere) — for example, expanding Bolsa Familia benefits instead of pursuing continued increases in pensions for older Brazilians10 — can allow governments to maximize impacts while keeping a lid on program budgets. Speaking of giants, if we were to think of Pen’s Parade — named after the Dutch Economist Jan Pen, who imagined watching a parade from his window where people passed in order of their incomes represented by their heights — in Brazil, we’d be watching lots of very short people walk by for a long time before witnessing quite a few giants at the end. The Gini coefficient is useful in describing changes in the distribution of incomes using a single number. However, the coefficient does not tell us whether the observed changes are due to changes at the bottom, the middle or the top of the distribution. Had the income growth rate among the poor been equal to the national average, the reduction in poverty would have been more than 60 percent lower. The Gini coefficient in Mexico, while not as high as in Brazil, was still very high, at around 0.52 in 2000. In the absence of experimental methods, economists usually resort to what is referred to as quasi-experimental methods, but such methods are also less useful for isolating the role of Bolsa Familia on the substantial decline in inequality in Brazil since the early 2000s. This method of running “counter-factual simulations” described refers to the fact that the researchers run many simulations (to identify the contribution of each source in the per capita household income equation) to create counter-factual scenarios: “What would have happened if all the factors changed in exactly the same way but one factor remained constant?” Such counter-factual distributions are, of course, the result of a fictitious exercise, where each factor can be modified one at a time. In reality, it is unlikely that certain factors can vary while others stay constant. Cash transfers can also decrease poverty and inequality by raising the productive capacity of beneficiary households, i.e. by increasing their earnings or income stream from other sources. No such evidence exists for Brazil. However, University of California, Berkeley, economics professor Paul J. Gertler and others found in 2012 that Mexico’s PROGRESA might have increased investments in productive activities among beneficiary households and raised their incomes. According to the World Development Indicators, the latest estimate of the Gini coefficient for Brazil was 0.55 in 2009. The average Gini coefficient for the 42 countries for which data was available for the same year was 0.42. Barros et al. reported in their 2010 study that poverty is much higher among households with children than among the elderly, while the transfers per elderly person are much larger than transfers per child. They argue that this fact gives Brazilian policymakers room to further reduce inequality without the need for additional resources by reallocating government transfers more optimally.